When I came across fresh shipment of salmon and sushi grade tuna at my favorite supermarket fish counter (we don’t have a fish store in town) I had to have some and, of course, sushi was on menu that night. 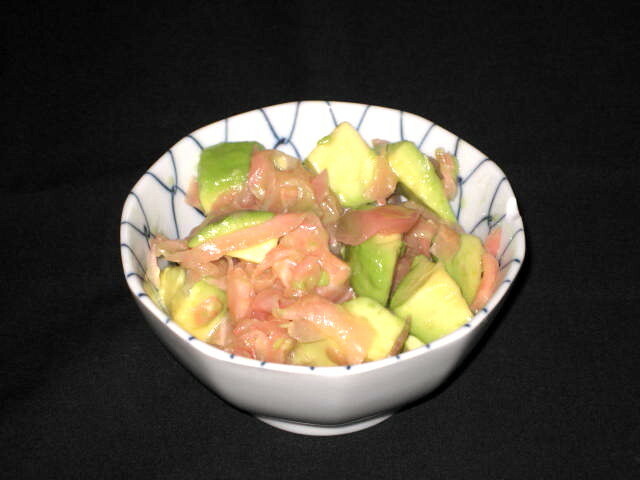 At the same time I bought avocado for salmon sashimi and gari to go with it. Then it hit me! Why not make some sort of salad with half of the salmon fillet (the belly part), whole avocado and about dozen slices of gari? In under 5 minutes new dish was born! I can just imagine how great this ceviche will be on hot summer day. Again, not much of a recipe but here goes. Mix all ingredients in mixing bowl being careful not to smash the avocado and serve in chilled serving bowls. Sprinkle Furikake on top (if using). Here is link to video “How to cut avocado”. Note: I am calling it ceviche because it does contain raw fish and is marinated in a base containing acid. Ceviche uses lime and my version uses rice vinegar. Also, it is similar to my version of Hawaiian Salmon Poke.